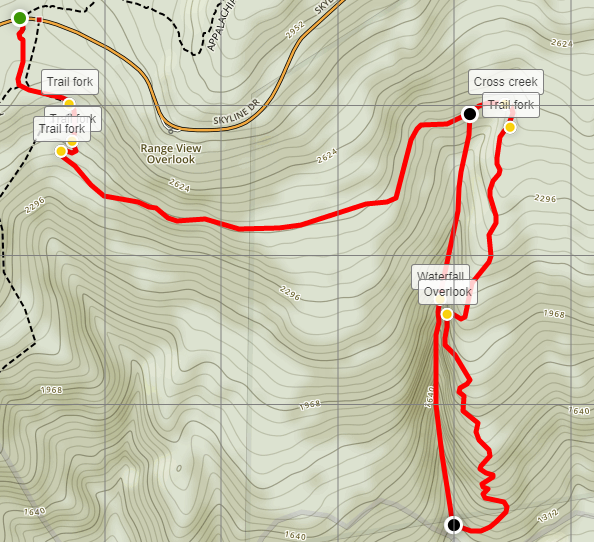 Situated between Mount Marshall (3,368’) and Hogback Mountain (3,474’), Gravel Springs Gap serves as the trailhead for this hike, as well as a number of others in the area. 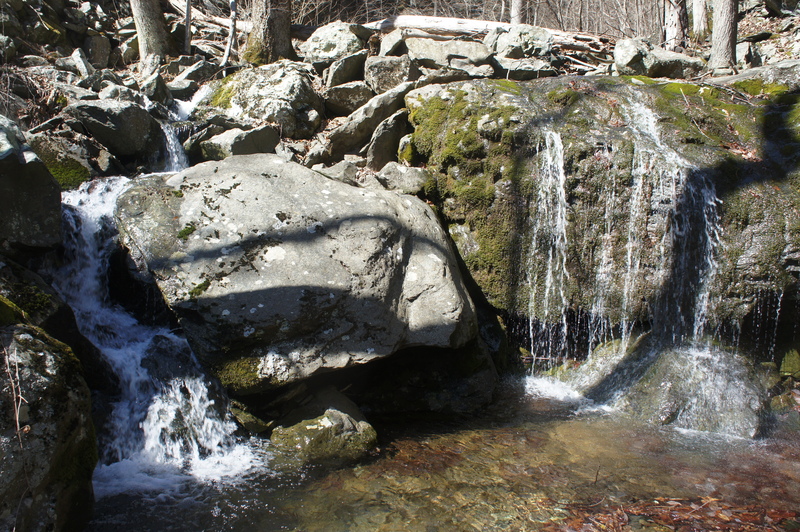 (Note: Gravel Springs Gap is located at around Mile 17.6 on the Skyline Drive.) 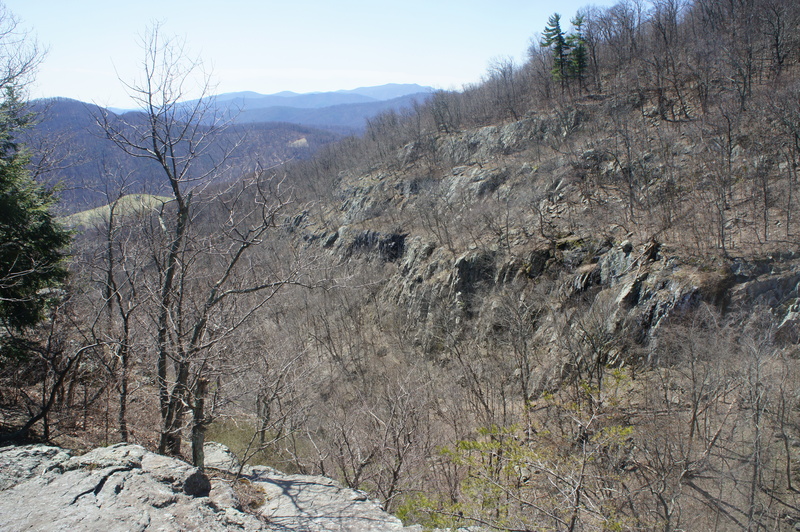 While the Appalachian Trail crosses Skyline Drive at Gravel Springs Gap, you will not be hiking on it today. Instead, head south on the wide, gravel drive at the end of the parking lot; this service road provides access to the PATC Gravel Springs Hut. Before getting to the hut, however, keep an eye out for the start of the Bluff Trail, which veers off to left just as the forest road cuts right, at approximately 3/10 mile. Follow this narrow footpath as its heads south and approaches a second junction at around 0.35 miles. Stay left again at the fork. After a downhill turn to the west, stay left once again at the third trail junction, leaving the maze of interlocking trails in the Gravel Springs area behind. 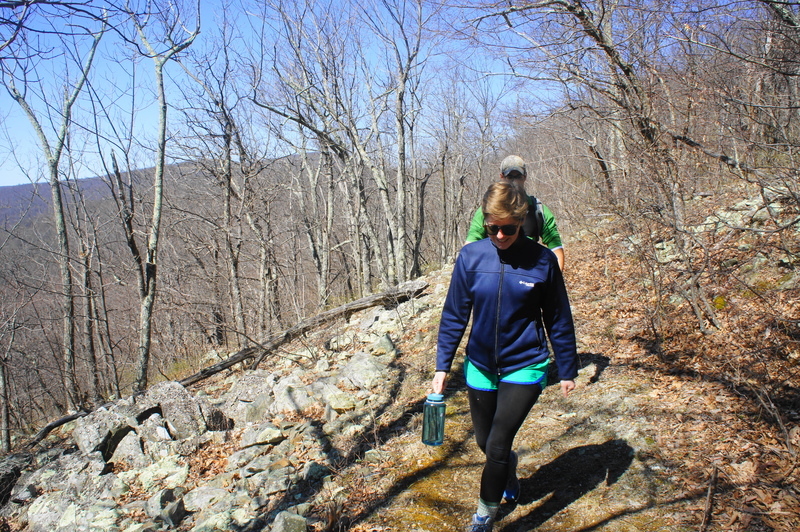 Bearing east on the Bluff Trail, the incline gradually picks up around 6/10 mile as the path hugs the south flank of Mount Marshall, named for the family of famed 19th century Supreme Court Chief Justice John Marshall, a Virginia native. After about a half-mile, the climb eases and briefly gives way to a brief downhill. There is not much to see during this part of the hike, save for a gradual increase in the number of basaltic boulder piles as you approach Big Devils Stairs. Around 1.7 miles from the trailhead, the Bluff Trail crosses Big Devils Stairs Creek, still well upstream of the gorge but a welcome sign that you are nearing the canyon. 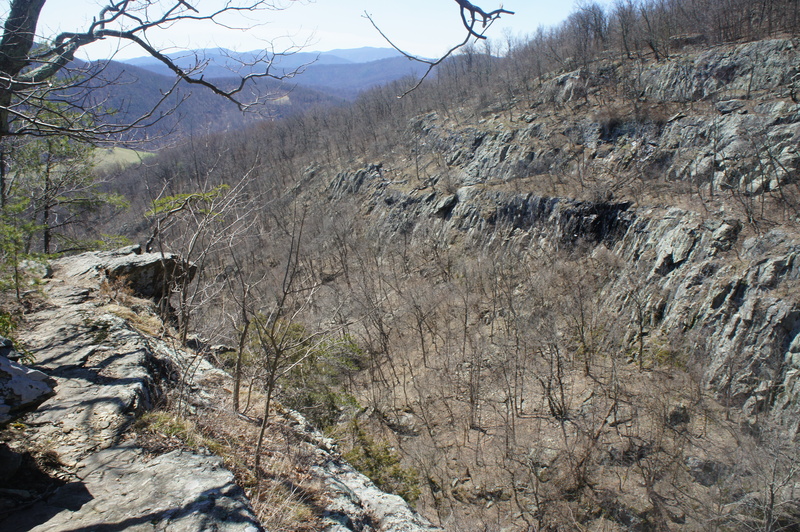 About 1/10 mile later, the trail crests a low ridgeline and splits, with the Bluff Trail continuing left while the 1.3-mile Big Devils Stairs Trail begins its snaking downhill to the right. Bear right on the blue-blazed path as it enters a charming patch of mountain laurel, with occasional Virginia pines towering above. (Note: For overnight hikers, there are several good campsites in this area.) 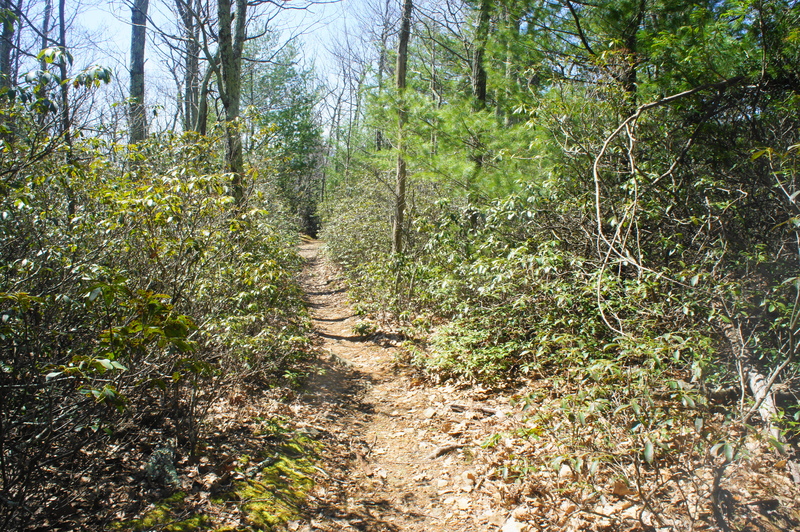 As the mountain laurel begins to disappear, the Big Devils Stairs Trail descends in earnest, following the woody ridgeline that will form the eastern end of the canyon. Many visitors will turn around here, but the determined hiker can continue as the footpath hugs the canyon rim for the next 1/10 mile, allowing for several excellent photo ops. 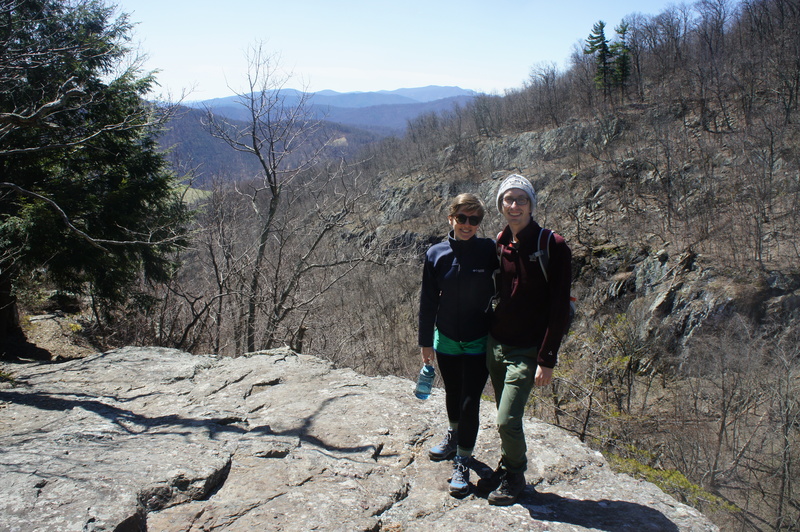 From the overlook, the trail sheds nearly 800 feet in elevation over the course of less than a mile. As it turns away from the cliffs, the trail becomes harder to follow—keep a keen eye out for the faint blue blazes marking the way. 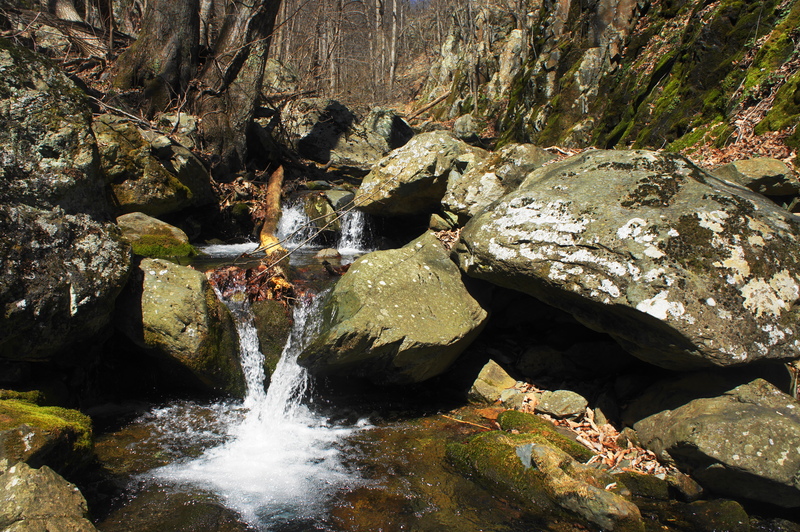 Eventually, at just over the 3-mile mark, the formal trail ends abruptly at the banks of Big Devils Stairs Creek. A thin barbed wire fence forms the edge of the park, with private property beyond. …But if you have made it this far—and you are prepared for some mild bushwhacking and rock scrambling—you may as well take the alternative route, straight up the heart of the canyon, back to the start. (Note: This is only recommended for winter and early spring, when there is no poison ivy or other pesky undergrowth.) It’s a real treat—while there is no established path, or even a faint social trail, it is hard to get lost as you follow the creek upstream. The stream begins as a mild meander, taking short tumbles as it cuts through the valley. 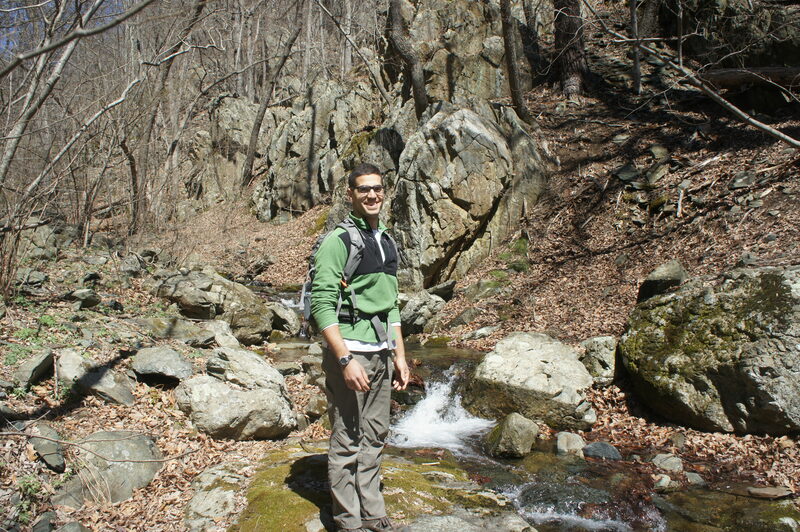 After about 250 yards, however, hikers will enter a narrow gorge section, where the cascades grow in height and number. High, moss-covered walls line the canyon, making for an alluring sight. Expect to have to rock-hop across the stream multiple times as the canyon grows tighter. For a brief period (at least when we were there in March 2018), the stream disappears, hidden under piles of sediment and other debris that have filled the canyon. Soon enough, the water resurfaces and the cascades continue, interrupted by small and solemn pools. 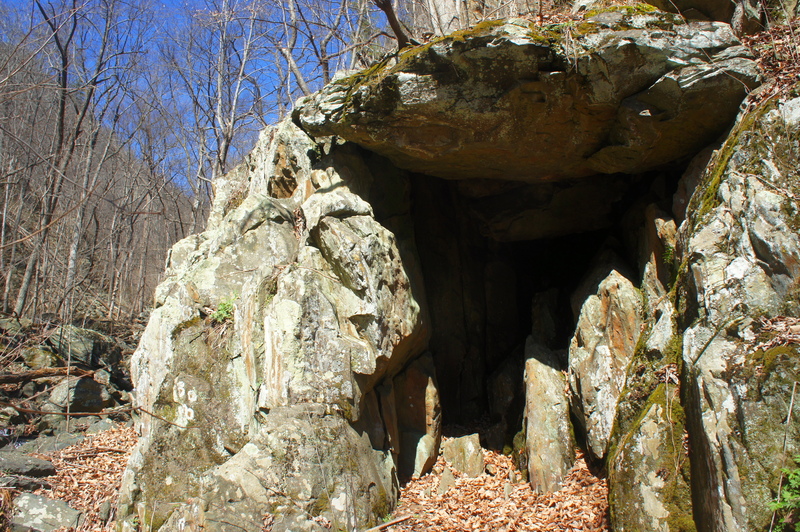 About 2/10 mile up the creek, a small, dark cave appears on the right. The waterfalls grow larger and the walls higher as you continue upstream. After mounting another dry boulder jam, the stream reappears as it hugs a mossy wall on the right. 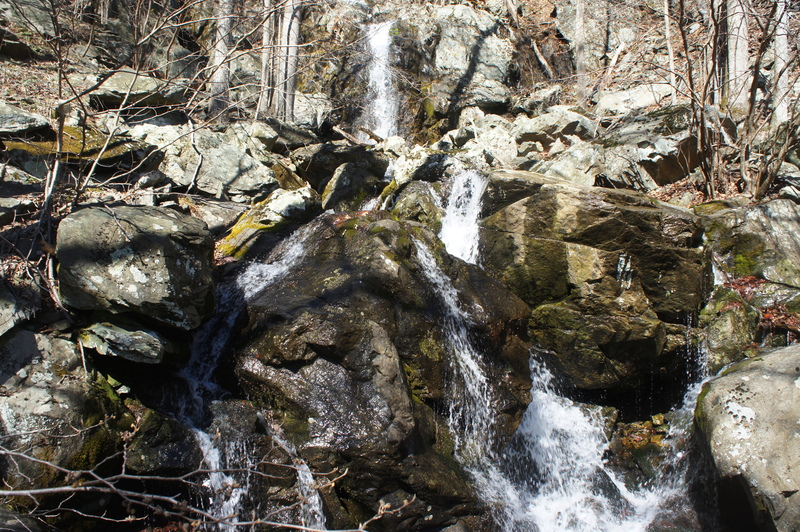 At about 3.5 miles, you will enter the best part of the hike: a series of terrific waterfalls, inaugurated by a beautiful cascade that drips straight over a vibrant green rock face. A great set of multitiered cascades follows around 10 minutes later. 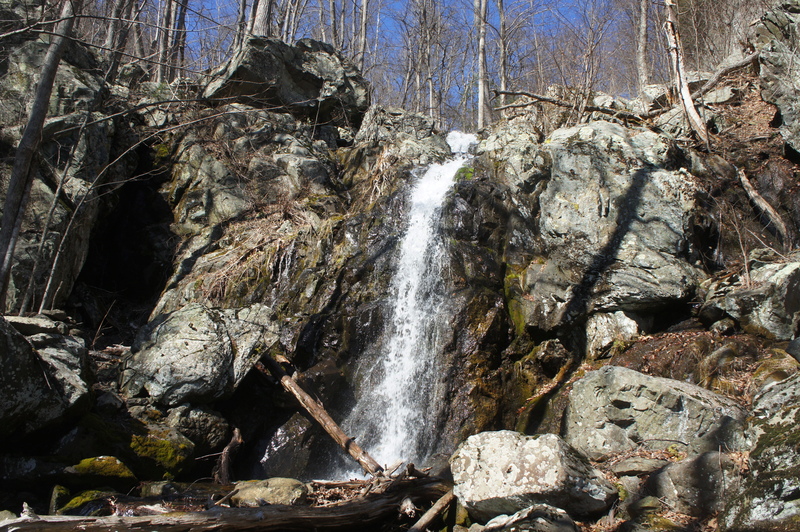 A bit of arm-strength will help you overcome the hike’s toughest obstacle at about 3.65 miles, where skirting a 12-15 foot waterfall requires mounting a wet boulder. 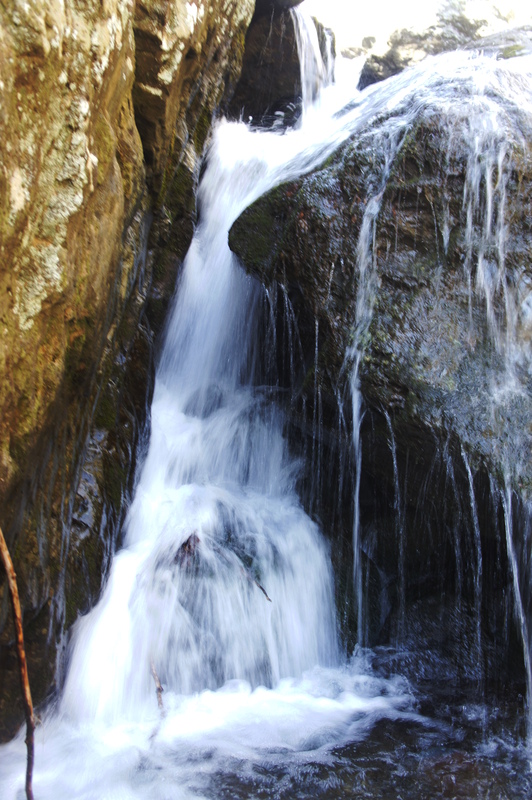 The terrific views culminate in a 20-25 foot waterfall, the canyon’s tallest, at about 3.7 miles. 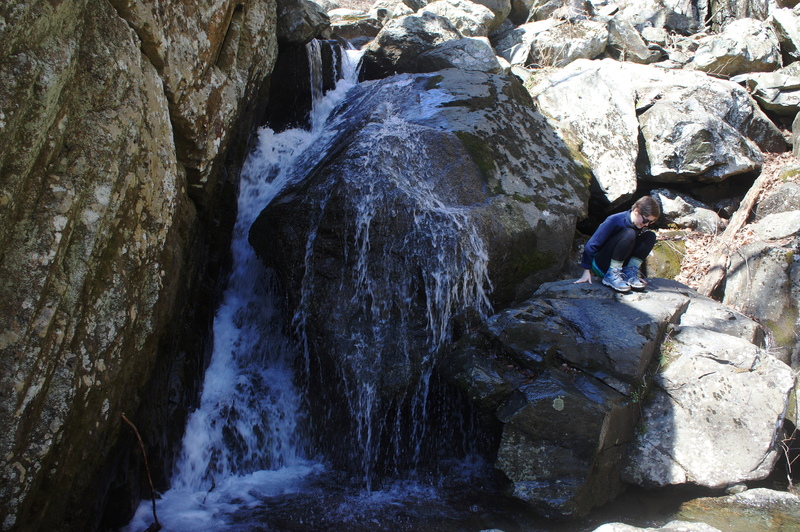 Here the creek tumbles straight over a slippery chute, dropping into a small pool. Surmounting the falls requires swinging out to the right or left to clear the sheer rock wall. 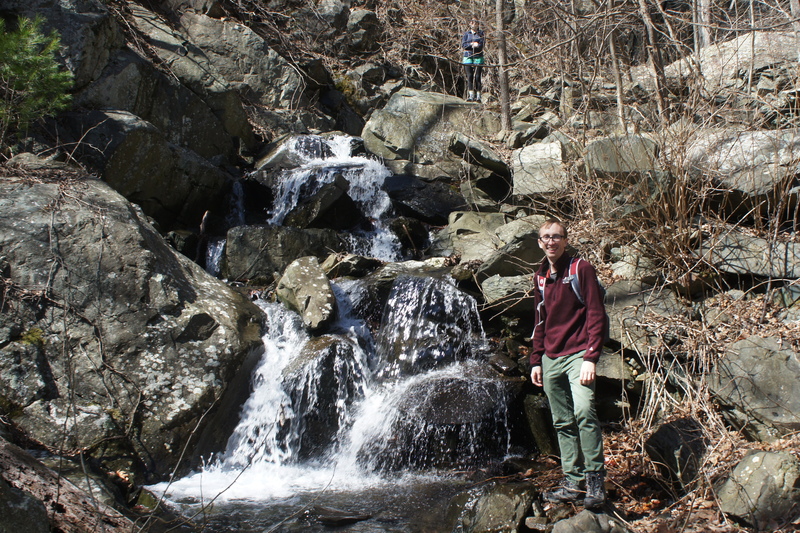 Above the final waterfall, the waters calm, the valley widens, and the route gives way to dense brush. Beware of thorns and branches, which clog both sides of the creek for the next ½ mile. Despite this frustrating finale, most visitors will find the alternative route—which links back up with the Bluff Trail at around 4.3 miles—well worth the work. From the end of the bushwhacking route, turn left on the relatively level Bluff Trail (heading away from the creek) and follow the trail back to the first of the three trail junctions in the Gravel Springs area at 5.5 miles. Make three straight right turns at the trail forks, ending up back at the Gravel Springs parking area after a relatively short but strenuous, 6-mile round-trip hike. While it’s possible to cover the round-trip to and from the overlook in 2-3 hours, be sure to allot between 5-7 hours if you plan to explore the canyon in full, including the off-route excursion. 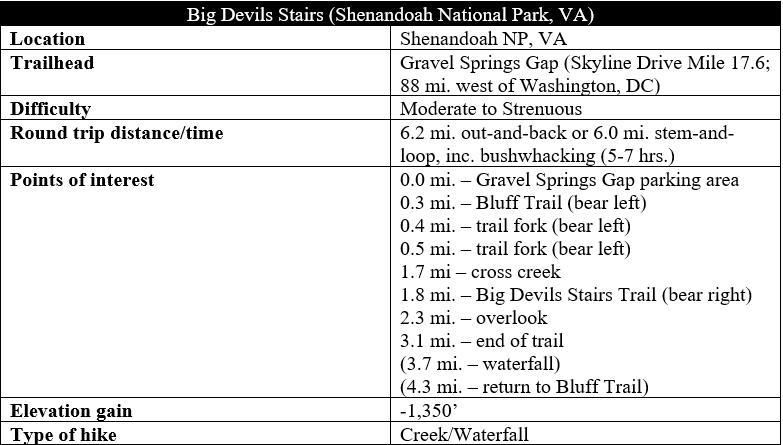 This entry was posted in Shenandoah National Park, Strenuous Hikes, Virginia and tagged Big Devils Stairs, Bluff Trail, bushwhacking, Gravel Springs Gap, scrambling, Shenandoah, Virginia, waterfall. Bookmark the permalink.